I've always loved art, always wanted to design and make jewelry. My beloved late aunt, Lucy Glick, a wonderfully talented and highly regarded professional artist, discussed color theory with me when I was just a small child. She told me, even then, that I had an innate sense of color coupled with the ability to discern and remember even slight differences in hue. 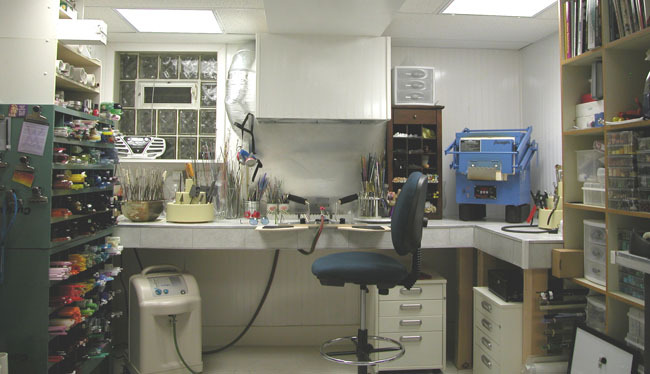 I loved to watch my dad, a manufacturing jeweler, as he sketched jewelry designs on paper and then executed them in gold and platinum at his bench. He wanted something better for me and resisted my pleas to let me go into the business with him, even after I took evening classes in direct metal sculpture while I attended college by day. Several years ago, after my dad had retired and I had been practicing law for many years, I finally took the leap and haven't looked back since. At first simple in design, my jewelry has evolved over the years and I find myself tearing apart older pieces in order to remake them to reflect new styles and new skills. I started out stringing just semiprecious stone beads, then began to incorporate artist-made fused dichroic glass beads into my work. I used fused pendants, acquired initially through eBay and later directly from the artists. Then I found - and was completely enthralled by - lampworked glass beads, made individually in the torch. I was hooked. I began making my own torchworked beads, then took classes in PMC (precious metal clay) and metalsmithing. As I begin to incorporate these new skills into my repertoire, I find that they enhance rather than replace the techniques that preceded them. Much of my jewelry is strung on SoftTouch (made by the SoftFlex company), a very strong but flexible coated jewelry wire. I prefer to use wire because, unlike silk, it does not need frequent restringing and is more durable with glass, metal and gemstone beads. Nearly all of my necklaces have magnetic clasps of varying strengths (stronger magnets for heavier pieces). The magnets are simply wonderful. They fasten and unfasten with ease yet are strong enough to be quite secure. When small children grab them, they simply unfasten rather than breaking. They are particularly good for those whose arthritis -- or long fingernails -- make it difficult to use traditional clasps. The magnets also allow for the use of extenders to make necklaces longer. Many of my necklaces come with matching extenders. For those that do not, I can supply either a matching extender or a simple gold-filled or silver extender in any length for a small additional charge. Note that, in an abundance of caution, magnetic clasps should not be worn by persons with implanted pacemakers or defibrillators. The metal beads and findings in my jewelry are either fine silver (.999 silver), sterling silver (.925 silver) or gold filled. I rarely use vermeil (sterling silver plated with yellow gold) and almost never use plated base metal beads or findings. Except in custom pieces, I rarely use 14K gold, as the metal is sufficiently soft that hollow beads can dent, and beads made with thicker walls are prohibitively expensive. Gold-filled beads and findings differ from gold plated beads in that plated beads and findings have a thin coating of gold which can quickly wear off with use, leaving an unsightly dull finish. Gold filled, on the other hand, is made by sandwiching another metal between sheets of gold and then rolling it out. The much thicker layer of gold is permanently bonded to the metal beneath and takes many years of wear before any of the base metal beneath would show, if ever. To the eye, it is virtually indistinguishable from solid 14K gold. Although flexible and strong, pieces made with jewelry wire should not be bent or folded. To store, hang the piece or roll it gently around your hand to form a circle, then place it into its box or silk bag. It can be cleaned with a damp cloth or a dry jewelry cloth. It should not be submerged in any liquid and should not be worn while bathing or swimming. Sterling silver should be stored in a closed container with anti-tarnish paper so that polishing will not be needed as often. Although all of the artist-made glass beads I use have been kiln annealed for strength and durability, glass - like gemstones - can break if dropped on a hard surface or otherwise abused, and injury can result. With proper care, however, your jewelry will give you many years of enjoyment. Restringing is always available (see below), and companion pieces such as bracelets and earrings can be made upon request if not already included. 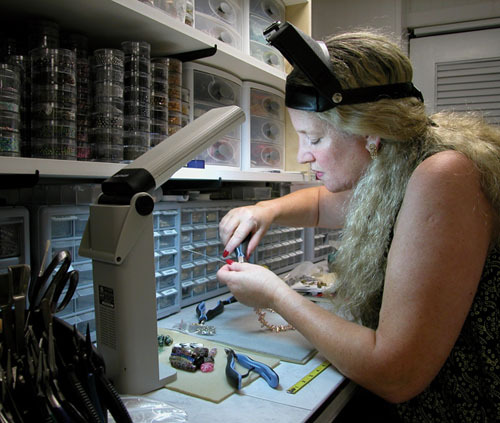 All of my jewelry is carefully made using high quality components. 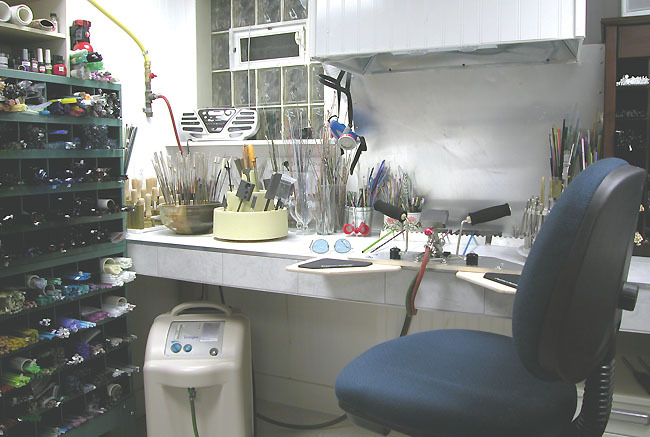 In the unlikely event that restringing is necessary due to defects in material or workmanship, it will be done at no charge within one year of purchase, and for a small fee thereafter based upon the complexity of the design and the availability of matching beads. I began designing and making jewelry long before I made my own beads, so the work that you see on this site will continue to incorporate beads made by other artists as I use up the many beads that I still have in my bead stash. Most of the beads that I feature in my jewelry are either flat, fused glass beads, or round, oval or sculptural beads that are handmade, one at a time, in the torch. These are variously referred to as lampworked, flameworked or torchworked beads. The process of making glass beads is both fascinating and highly addictive. 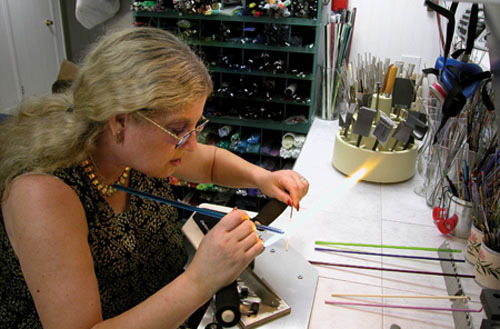 I use rods of glass in many colors from Italy, Germany, Japan, Czechoslovakia, Canada and the U.S. The rods are heated in the flame of a torch until the glass begins to melt. As it melts, it is wound around a steel mandrel that has been coated to prevent the glass from adhering to the bare metal. The mandrel forms the hole in the center of the bead. Once the glass is applied, it is shaped using gravity, surface tension, and tools made of graphite, marble, brass or other metals. Once shaped, the bead can be decorated with thin strands of glass called stringers, with ground glass called frit, or with bits of fine silver, gold or copper in the form of wire, leaf, foil or mesh. Designs can be simple or quite complex. Some beads are fumed with pure gold or silver once they're shaped and decorated. The photo on the left is my studio. (I kept the photo rather large so you can see detail.) Most of the glass rods are stored in the bins on the left. Beneath the workstation is a SeQual Integra10 liter oxygen concentrator. Identical to those used for medical purposes, the concentrator extracts oxygen from the surrounding air and sends it to the torch, saving me the headache of dragging large, heavy oxygen tanks down to my basement, and ensuring that I never run out in the middle of a bead. On the left side of my bench, coated mandrels stand in a sand-filled stoneware bowl, ready to be used. The enclosed hood covers my 750 cfm (cubic feet per minute) exhaust fan which draws the toxic fumes given off as glass is heated in the torch, and exhausts them to the outside through a 10 inch hole drilled through the concrete foundation wall. Directly beneath the hood is my trusty little torch, a Nortel Minor Burner given to me by beadmaker extraordinaire Corina Tettinger. (�Gracias, querida!) I also have a Bethlehem Betta torch that I can swap out with the Minor. I run both of them on natural gas, which I prefer over propane for reasons of both safety and convenience. My beautiful blue Paragon F-120 kiln is on the right, sitting atop landscaping bricks that I've painted black. In the closeup photo, you can better see the bench and the safety glasses that protect my eyes and filter out the flare from the flame so I can see what I'm doing! On the wall is my natural gas hookup with emergency shutoff valve; a fire extinguisher is partly visible above the glass storage unit. Hanging on the left side of the vent hood is the respirator I wear when working with metals. It is essential, no matter how efficient the ventilation system, to "go Vader" when working with the very toxic fumes given off when silver and gold are heated. My studio is rarely this neat. I took these photos right after I rebuilt and there were still a lot of details to finish. I hadn't yet hung my "pyromaniac at work" sign, or the gorgeous new "hot glass, cool beads" and "casa de chaos" mini-quilts made by my uber-talented friend and teacher, Ann Scherm Baldwin. My marble and graphite marvers were still stored away, as were my posters, inspiration photos and shadowboxes of collector beads.